Kitchen Still Life is a counted cross stitch design from Joseph Holodook. With cooking in mind this design has everythig a kitchen needs. Contains: 14-Count Aida fabric, 6 strand 100% cotton floss, needle, graph, instructions. Size 11"x14" Made in the USA..
Lemons by Dimensions makes an elegant and eye-catching kitchen display. This counted cross stitch design features a beautiful palette of yellows and greens. Size: 5" x 7". Designed by Jane Shasky. © Jane Shasky Studio, 2013. Counted cross stitch kit contains: • Presorted cotton thread • 14 count light green Aida • Needle • Easy instructions..
A slice of the good life awaits you. Savor the moment as you stitch this design on 14 count beige Aida. Kit also includes cotton thread, needle, and instructions. Kit contains cotton thread, 14 count beige Aida, needle, and easy instructions. Finished Size: 7" x 5" (18 x 13 cm). Designer: Susan Winget..
Mushrooms, Merejka - Cross Stitch Kit..
Good wine, good friends…what more can one ask for? This cozy still life will add some flair and flavor to your kitchen décor. Pinot Grigio by Dimensions in stamped cross stitch also makes a wonderful housewarming gift. Finished size: 14" x 11". Designed by Susan Winget. © Susan Winget. 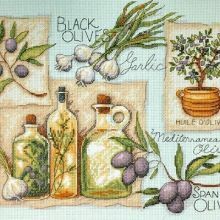 This stamped cross stitch kit contains: presorted thread, printed muslin fabric, needle, instructions..
Olive branches, garlic bulbs, and herb infused oils make a perfect collage for a kitchen or any room with a Mediterranean flair. Stitched on 14 count light green Aida, this design uses Half Cross Stitch for artistic effect. Kit contains cotton thread, 14 count light green Aida, thread palette, needle, and easy instructions. Finished Size: 14" x 11" (36 x 28 cm). Designer: Susan Winget.. Welcome Friends Item #: LP182733 (13733) Sweet clusters of grapes are the focal point of this charming welcome sign. The design is stitched with warm shades of cotton thread on 14 count beige Aida. Kit includes an alphabet for optional personalizing. Stitch one for yourself or as a housewarming gift. Kit contains cotton thread, 14 count beige Aida, thread palette, needle, and easy instructions. -..